10-L, Left-Handed Acoustic Guitar from Cuenca. 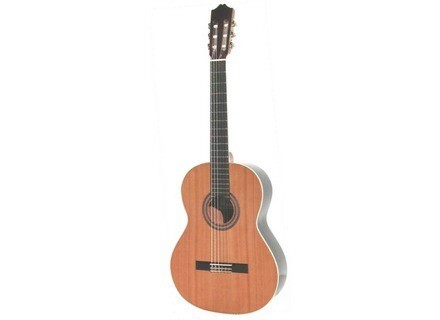 Mid-range classical guitar, solid cedar top, clear matt varnish, pretty. nothing special, but the woods are good for the price. bridge is reversed (feasible oneself). unjustified price difference (100 € more in some stores), buy more of a right-handed model, the seller will amend bp for nothing. Apart from the references you will not see the difference as the classics are symmetrical. mechanical quality, keep the agreement. For the price, excellent in the range € 200-300. Personally, I found that the sound is very balanced, just enough bass, and treble strings sound great for the price. When we play 6-string arrangements on this means, all the strings are audible.